Posing in our Icelandic sweaters (we got them at a second-hand store in Reykjavik). They had bundles of them, and it was a great saving. I grew up as a child making up stories in my head and daydreaming about the characters who I read in books. But the stories from real people's lives were the ones that shaped me more than any other book's plot--especially if I knew it was a story from a family member. I was lucky enough to have both of my grandmothers be some of the best friends of my life, and I never tired of the family stories they unraveled. The educator and author, Neil Postman, conveyed the importance of family stories when he said, "Human beings require stories to give meanings to the facts of their existence. This is why people everywhere ask, as soon as they have the command of language to do so, 'Where do I come from?' They require a story to give meanings to their existence. Without air, our cells die. Without a story, ourselves die." Indeed, stories are my breath of life. They have given me a sense of place--especially when I was young and the world was a vast, unknown territory. I always knew where I belonged because my parents and grandparents told me stories. This was the pride my father gave to us growing up--to be of Viking heritage. 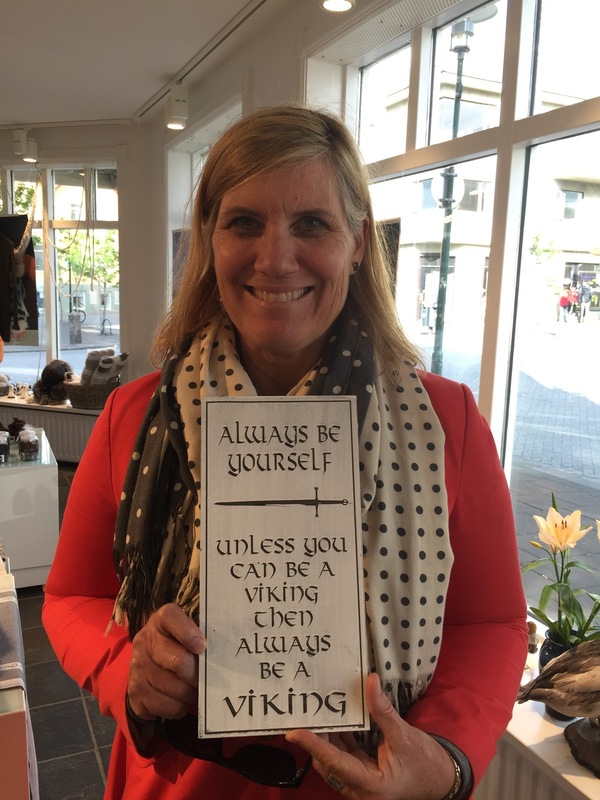 I saw this in a Reykjavik shop, and had to memorialize it. My husband and four boys at the Saga Museum in Reykjavik--dressing up in the Viking apparel. I am half Icelandic. 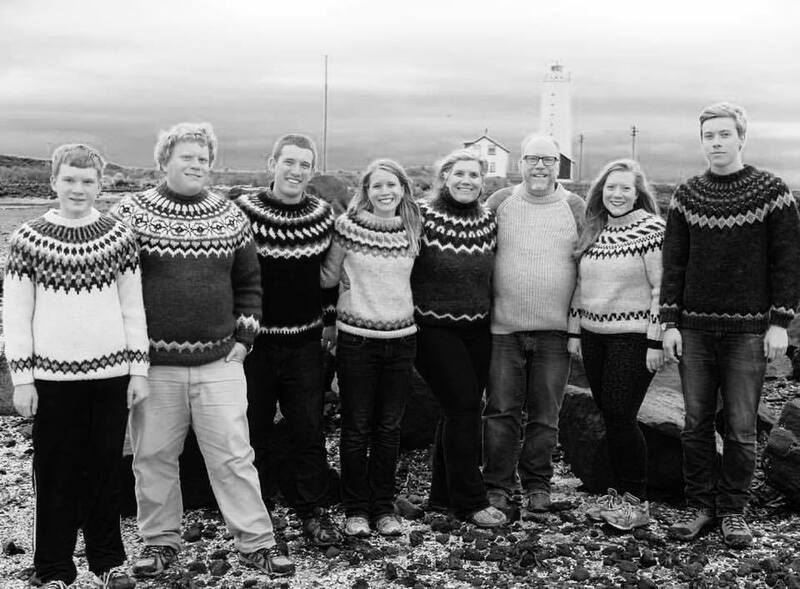 My father has always lauded his Icelandic ancestry to his wide cast of posterity, and we all swallowed his Icelandic pride--hook, line, and sinker. To be Icelandic, in our minds growing up, was akin to having a magnanimous gift. He told us we were strong and resourceful (we knew our ancestors farmed with volcanic rocks surrounding them--often with the icy ocean air billowing around). They rowed in fierce ice storms for days looking for fish, with bleeding palms. Somehow the message of being resilient was transmitted to us through a myriad of stories, from people who did hard things. Did not our great grandfather Eggert who was an Icelandic ship captain sail to Denmark to bring food when his community in Iceland was starving? What about my great-grandmother, Gudrun Vatnsdal Myres, who lost five of her children before they were two years old, and endured the tragedy of a 15-year-old son be struck by lightning as he worked alongside his brother in the field? When I was a young mother walking through a crowd, I always held my children a little tighter because I remembered my grandmother's story of getting kidnapped by some gypsies (that was always our favorite story to ask her, and we repeatedly begged her to tell us it again and again). My own life's experiences were somehow coupled with people whom I had never met, but who gave me solace and strength when I needed it. 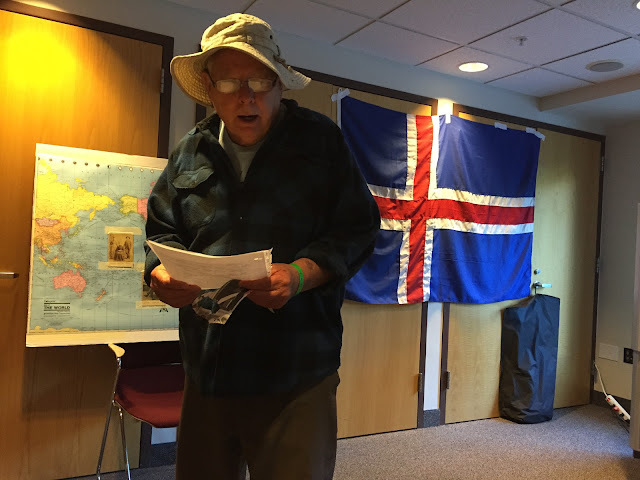 My dad (in a fisherman's hat, no less) at a recent family reunion (with Icelandic map and flag) in the background. My father, now a grandfather, and great-grandfather, extolling Iceland to his posterity this summer. We all are still riveted by his stories. Sometimes he peppers them with accents and new details. My mom with Naomi her granddaughter. She made this Icelandic dress for her for the reunion. When my own son was diagnosed with autism or other struggles erupted, these characters in my family story, my people, gave me the courage and pluck to persevere. As a child growing up, and even now into my adult years, I have been asking about the stories of people who are in my cast of characters, in my story. Their stories made my world make sense. I better understood what I wanted to be like, what morals and principles I wanted to live by, and how I wanted to pattern my own life. In the New York Times article, 'The Stories that Bind Us,' by Bruce Feiler, he reinforces what I have always known by a study of two psychologists: "The more children knew about their family's history, the stronger their sense of control, the higher their self-esteem, and the more successfully they believed their families functioned." In other words, family stories and traditions give children a strong foundation--to bounce back when life's journey becomes bumpy and seemingly unnavigable. As Dr Duke and Dr, Fiviush, the two psychologists, suggested, we are able to recoil more easily when we have a "intergenerational self." We know someone before us has faced trials, someone who is linked to us, and our belief, if it ever wavered, returns. Karolina, my cousin, and her triplets. We hiked up Mt. Esja with them on the first night of our stay in Iceland. 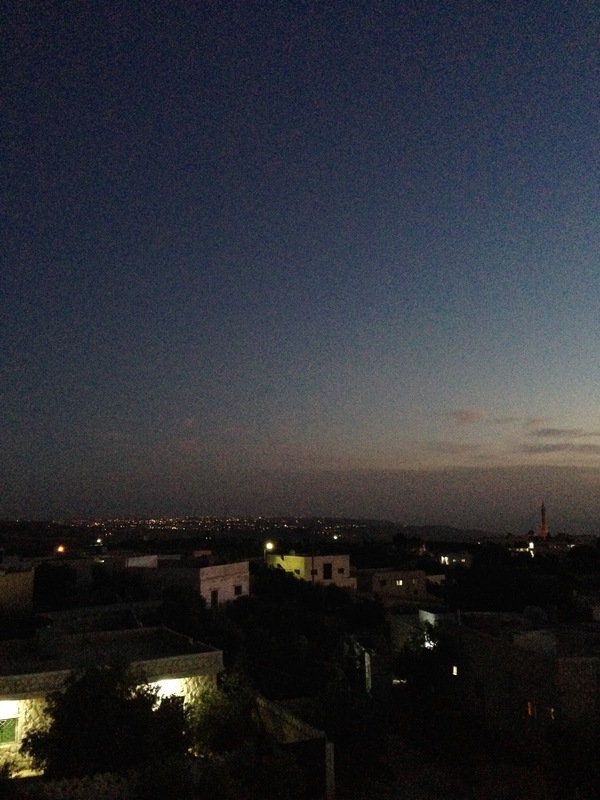 We returned at about 3 am--in complete light. No need to worry about water because you can refill at any waterfall that is flowing down the mountain. And if you need a little invigorating nap, you can always take a snooze on the six-ten inch high moss that is alongside the path. Did I mention all the wildflowers? This summer our family had the opportunity to visit Iceland (I had been there many years before my oldest child was born). But I had always longed to go back and show them the stark, pristine beauty of Iceland--for them to have the connection with their people and widen their "intergenerational selves." We carried our tattered "green Vatnsdal book" in our backpack--a book my daughter and I had compiled of stories, life histories, genealogies, and even poems that had been written by my Icelandic ancestors. In a large bumbling van, we crisscrossed Iceland, trying to discover and understand those people who had once lived there. We visited their farms and drank water from their waterfalls. As I have become older, I am no longer the small child just listening to stories, but I now know I must transfer them to another generation. I am the reservoir, the keeper of stories, as once the people were before me. The more I know and cherish the people before me, the more I want to share their stories--to teach, strengthen, and deepen life's meanings to my family. I believe that knowing our ancestors and their stories give us not only a stronger commitment to persevere and overcome struggles, but feel a connection with ourselves that goes backward and forwards. To know we were put into a story with people who worked, loved, made mistakes, and hopefully, ultimately found joy, is empowering. The first day we arrived in Iceland we went to Laugardalslaug--a public pool in Reykjavik. 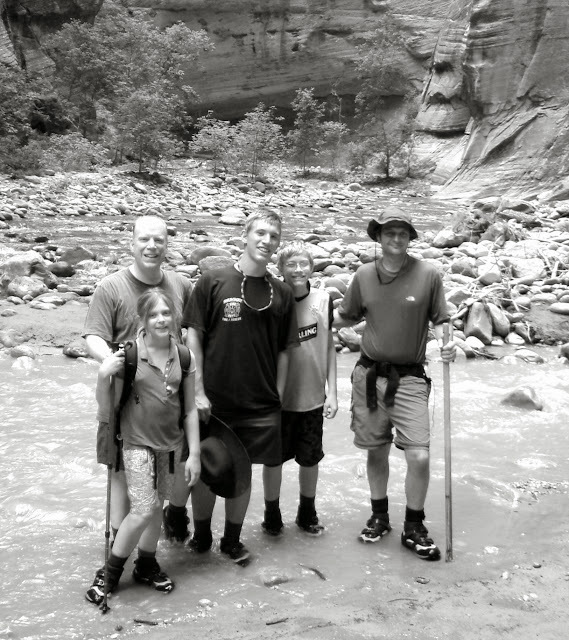 My husband and I wanted to show our children the FIVE hot pools, and one with even salt water in it that we had visited years before. In our eagerness to get out the door, we forgot our towels. Upon arriving, my sons were instructed by a handsome young man that they must quickly go buy some towels so that the dressing room floors do not become slippery. We were ignorant of the public pool rules. You must wash before you go into the pool (clothes off). My sons quickly went to buy some towels. But after our Iceland public pool experience, we could understand their careful scrutiny. The geothermal pools are used all year long, and people come from all over the world to see the Aurora Borealis as snow flutters around them in the pool. You will unlikely never duplicate the public pool experience you have in Reykjavik. Fast forward two weeks later: We are eagerly anticipating a family gathering with family and relatives, some of whom I have not seen in 28 years. On the last night. I am excited beyond measure, and for my children to meet these people who I have talked about for years (even one of my sons who is named after my relative's father, Olafur, whom I greatly loved). As we all walk in the lovely home, the handsome young man who was at the pool looks at my sons, and they look at him, trying to remember where they have met him in the last two weeks. Suddenly, they all burst into laughter, realizing that he is the one who instructed them on Iceland pool etiquette. We are related. Fishing in the Reykjavik harbor for cod, much different than their ancestors who often rowed in small boats to get their food supply in tempestuous, icy seas. Although not completely authentic to family stories, its amazing. 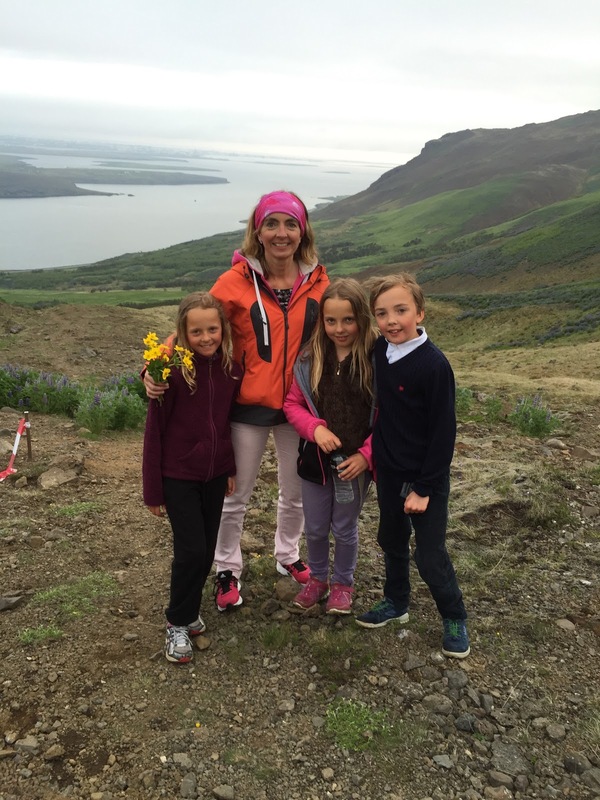 Iceland is a small place, but there were more bonds there than we could have ever imagined. 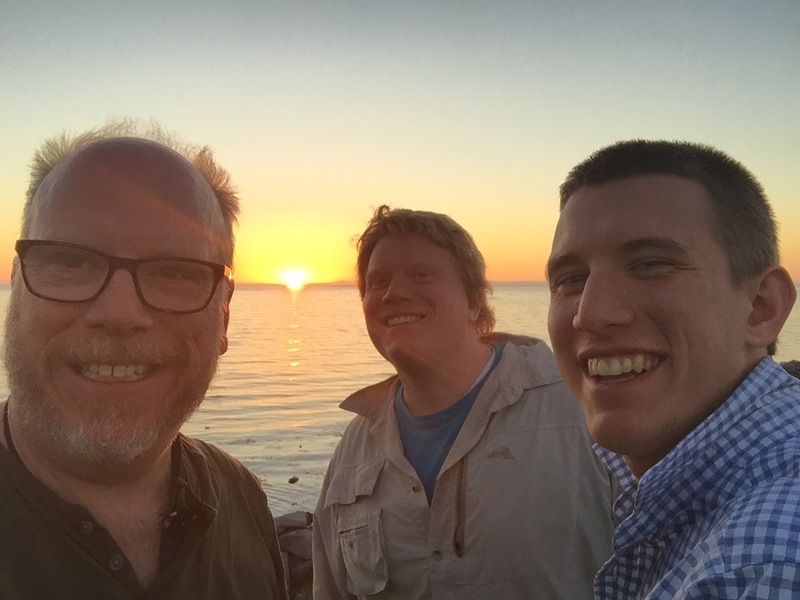 That last night in Iceland we stayed much longer than we anticipated because the sun does not set early in July. There was lots of laughter, and tears--a true glimpse of heaven. All the years erased; it was like none of us had gotten any older. My children said as we climbed on the plane to go home, "I feel like we have just discovered a whole new family. We are home." The first time I ever went to Iceland, my relative, Olafur, who I would later name our fifth child for invited me into his study. I distinctly remember him looking at me, and then asking, "Promise me you will not ever forget our connections--that we are family." I quickly reassured him and said, "I promise." He then looked at me again, and I will never forget his words. He repeated, "No, I mean promise me." I promised him a second time, and then he seemed satisfied. I hope he would not be disappointed with my promise. I think he was trying to tell me at that moment that staying connected, having strong family bonds, loving and forgiving one another is what this life is about. As long as I am alive, Olafur, I will try to be "a keeper of stories." I will try to keep my promise. 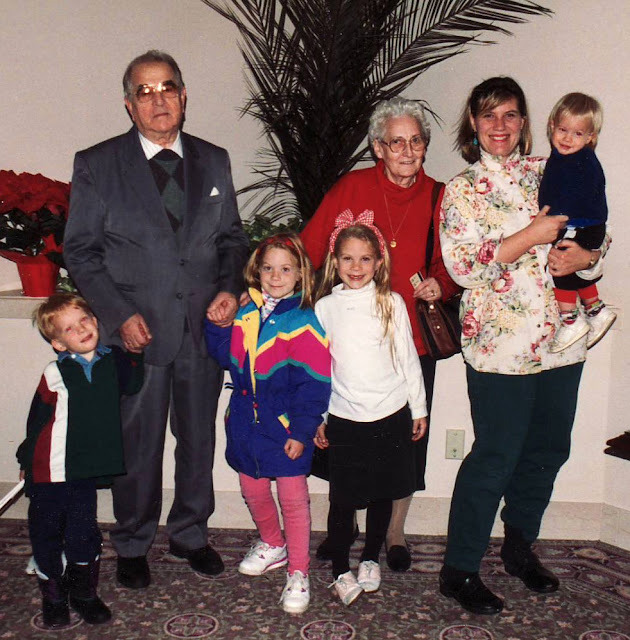 Olafur Olafson and Fridrika Bjornsdottir, with four of my children and me in Baltimore, Maryland where we were living at the time. Circa 1994. It was the last time I saw them. But three years later we would name our next child Peter Olafur after him. If the topic of music lessons or choice of musical instruments comes up in parenting circles, many approaches and philosophies can ricochet around the room. Since I have invested many dollars and hours on music lessons--with several different instruments (x six kids)--I have a few strategies and even still, some questions myself. I consider myself an amateur musician, and the aim was not to prepare them to be virtuosos or divas. Nevertheless, after sitting elbow-to-elbow on the piano bench with my kids when they were younger or helping them with instruments (I didn't even know about), I hoped they would somehow absorb the rhythms and tempo in their souls. Consequently, I was always on the look out--searching ways to have fun with music--to not seem tedious and boring. What would give them that spark or kindling to practice--you know, the big "P" word? A few of them were able to play in some famous concert halls growing up, but none have chosen it as a profession, which is absolutely fine. Yet it was my hope that music could heal their hearts in times of disappointment or loss. And have their hearts swell with joy too, giving them moments of soul-washing elation. From a family history perspective, I would tell them that after their grandpa learned to play the violin growing up, he was blinded a few weeks after landing on D-Day. Playing musical instruments (he learned three others after he was blinded) enriched his life immeasurably. In his two year rehabilitation, he learned to play the saxophone--to help with the dexterity of his hands. And he always had a harmonica in his pocket to play at a playground or gathering. 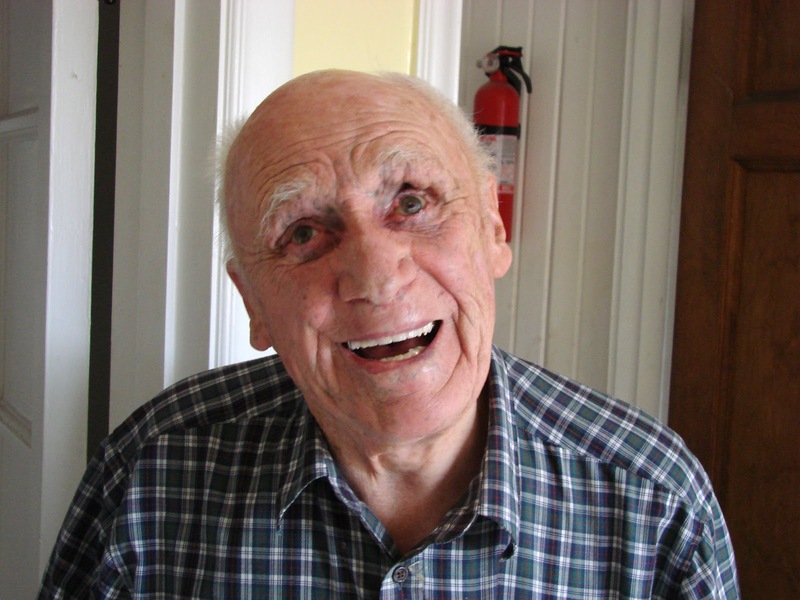 Later in retirement he played the violin in a band for people in rest homes--sometimes for the residents who were even younger than himself. 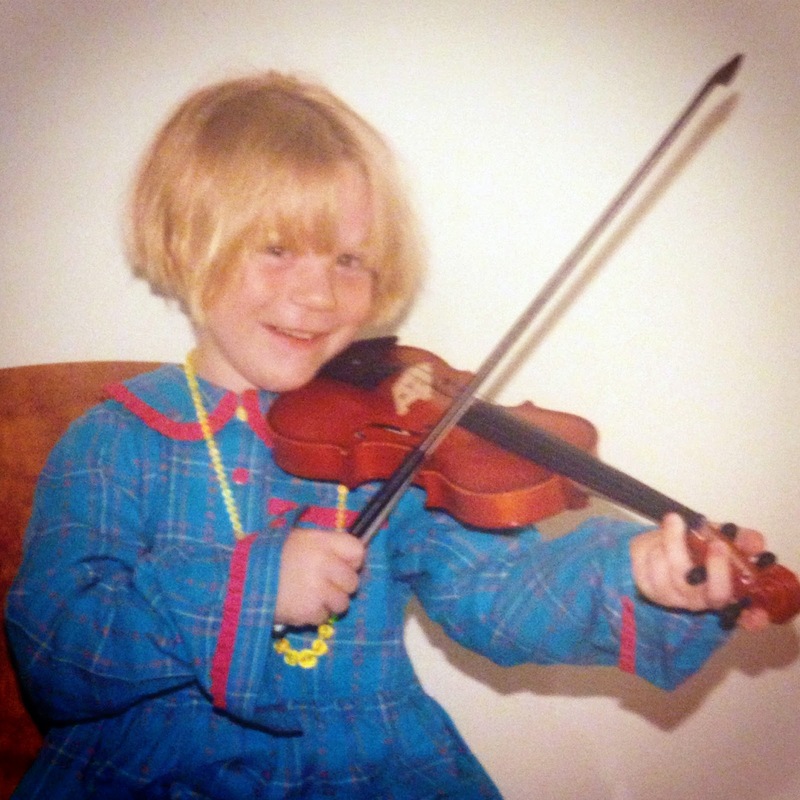 My daughter, at age five below, begged to learn to play the violin like her grandpa. My family history story about her grandpa worked! to this! 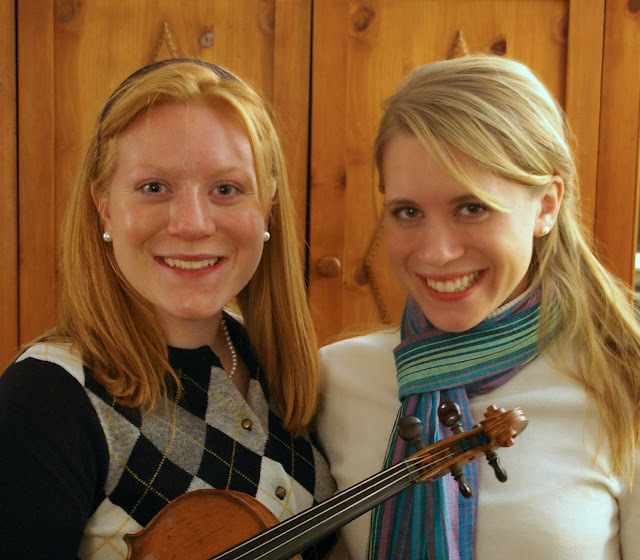 Two of our daughters, Sarah who accompanied her sister on the piano for her Senior violin concert. Sarah now accompanies a musical group for a major US university, just for the pure enjoyment. and plays for for a lot of activities and gatherings in her community. One of the best ways I have found to trigger motivation to practice myself, (because I am an adult learner of the cello), with my children, and people here in Qatar is to have a musical soiree. It is simply a gathering of people who want to share their musical talents, and applaud others. 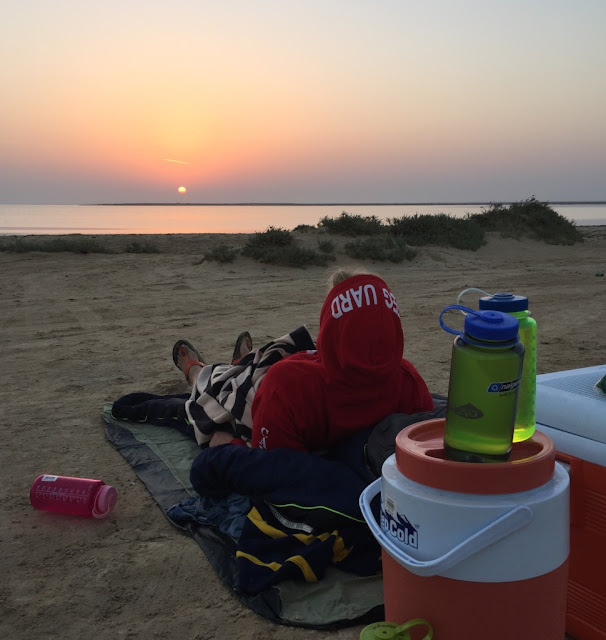 I have been organizing musical gatherings for years, but with the absence of many musical choices or venues (there are still some wonderful ones, just fewer), we Qatar expats hold our musical soirees regularly. Nothing else on our schedules can eclipse them. We create our own shows, and even make-shift concert halls here. Sometimes in a room flickering with dozens of candles, I close my eyes for a moment, feeling as if I could be in a Paris salon in the 1700's. Other times my living room has transformed to a 1970's cafe with James Taylor. 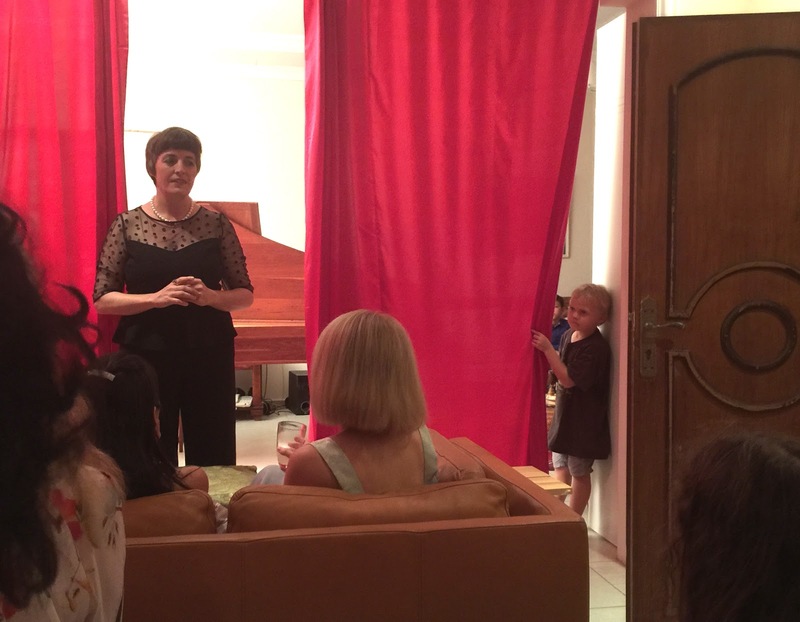 My husband says one of the best things about coming to live this Qatar expat life is to monthly attend my cellos teacher's house to hear her Baroque Ensemble she has organized--all of the instruments are Baroque and played faithfully in that style. There is even a harpsichord that is the center piece of the living room. My cello teacher organizes a musical salon every month that we eagerly anticipate with professional musicians from mostly Germany, but some from Prague, Bulgaria, New Zealand, and other far off places. Most of them play in the Doha Philharmonic. There are usually only about 50-70 people at the salon with a delicious international potluck afterwards. But we all know we are the recipients of an exceptional gift every month at the Baroque Ensemble. 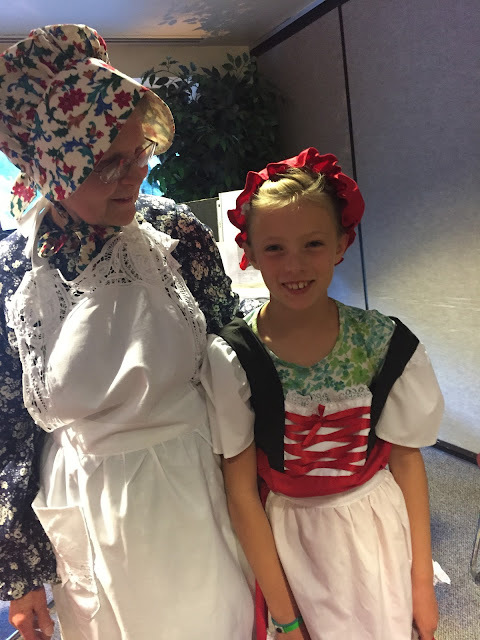 Each child that comes, including the adults, are riveted and transfixed, as the Baroque music permeates us. For anybody who is trying to learn an instrument, it is a catalyst to keep on practicing so that you can transmit the magic too. At my cello teacher's house, her little boy prepares to pull the curtain for the Baroque Ensemble--in his own living room. 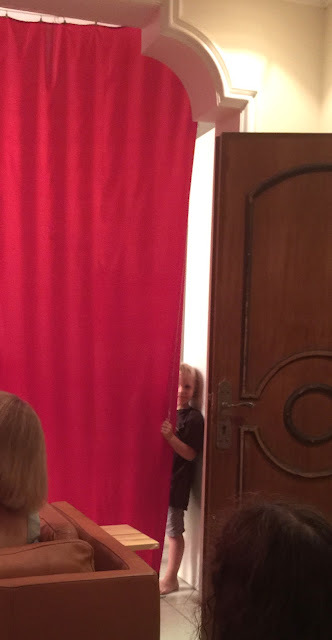 You can see it is a special moment when he will pull the curtain for the enchanting musical wonderland his mother directs. Children and cats wander through the house. There is an occasional ruffle of a child's play. But it is all that more special. We feel like we are perhaps in Bach's home himself. Katrin, my cello teacher, an opera singer from Germany, and the harpsichord player from South Africa. It is a rare treat to hear professional musicians monthly in someone's home--for the pure pleasure of playing music together. The price? Bring a potluck dish. To give children a love and gift for music is like giving them another language. As Hans Christian Anderson, the Danish fairy tale writer said, "Where words fail, music speaks." I know that my son with autism has a tremendous connection with music, and did from an very early age. Sometimes his singing has caused people to shed tears with his pure sincerity. That's what music does: it touches The Divine in all of us--not only entertaining us, but giving us holy moments. To understand that golden tongue of music requires practice, encouragement, and I believe, going to some musical soirees where friends and strangers can applaud your efforts. My favorite compliment after any soiree I have hosted is when a parent comes to me and says, "My child came home after the soiree and started practicing for the next one." 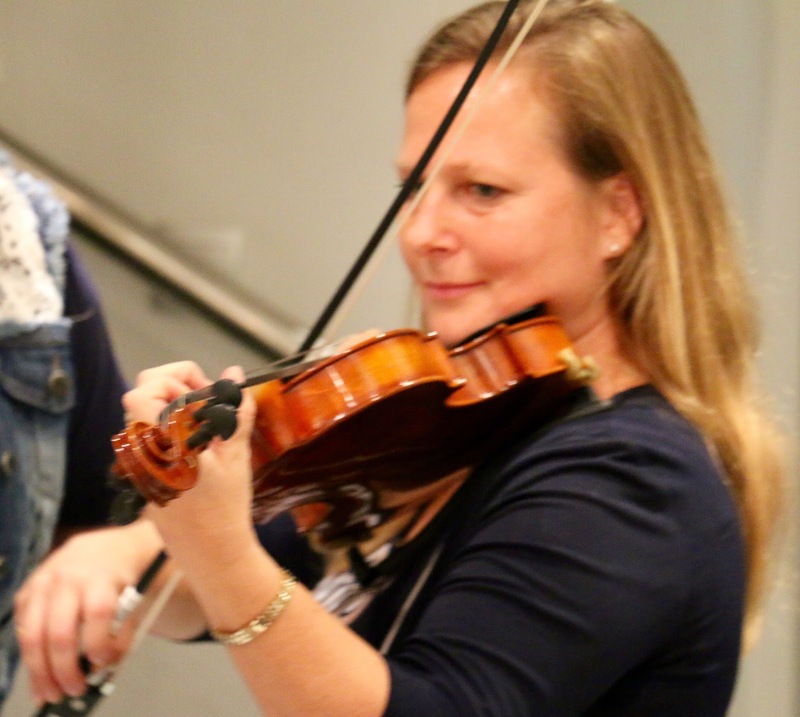 Soirees have the power to encourage children (and me too) in the journey of learning instruments--plus creating a wonderful community in the process. 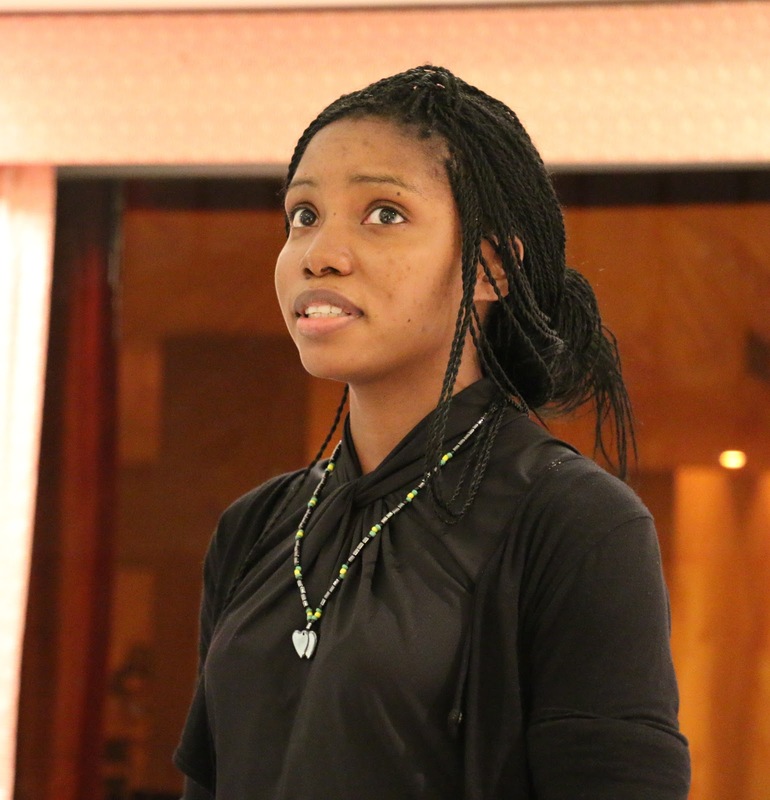 Here are a few pictures from our soirees in Qatar--lots of magic floating through the air! A group of teenagers entertaining us, with rousing claps and whistles in the background. A little sister is looking on, in complete rapture. This family has six kids, and never fails to come to our soiree. 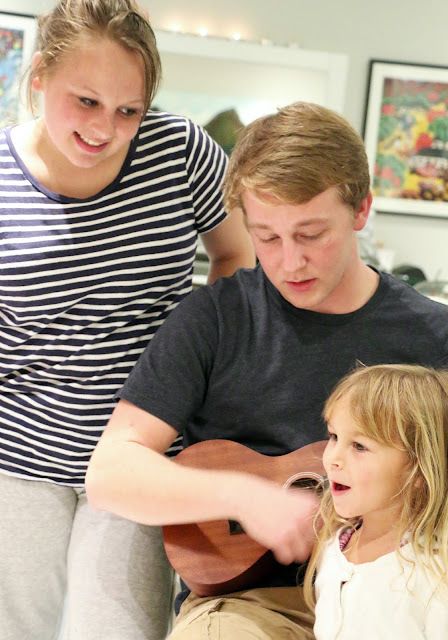 The oldest brother is accompanying his little sister on the ukulele. Each month people prepare to perform for the audience in our living room. V. singing a song from Jamaica. Although our living room is not a concert hall, it still takes guts and courage to preform for strangers and friends. Steve giving the younger generation some Beatles, and after an encore, played some more. K is an adult learner of the violin. She says that she determined to play every month at the soiree so it prods her to practice. Here are some video clips of some soirees in our home through the years. 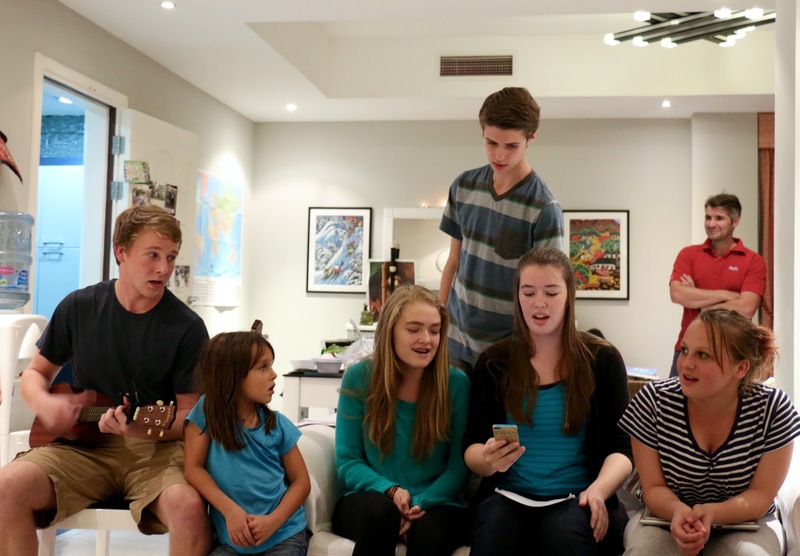 Last Christmas, with my daughter at the piano, playing Christmas songs with our friends from Normandie, France. Do you notice the backdrop of the Christmas tree fabric that I got from Ikea? There aren't many Christmas trees in Doha! 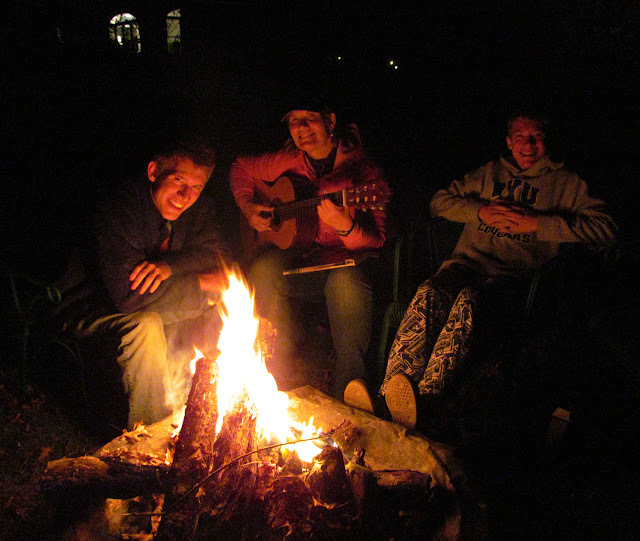 Herman, our good friend from Ukraine, who teaches piano, guitar, and voice here. We always feel so lucky when he comes to play for us--sometimes crooning like Frank Sinatra. 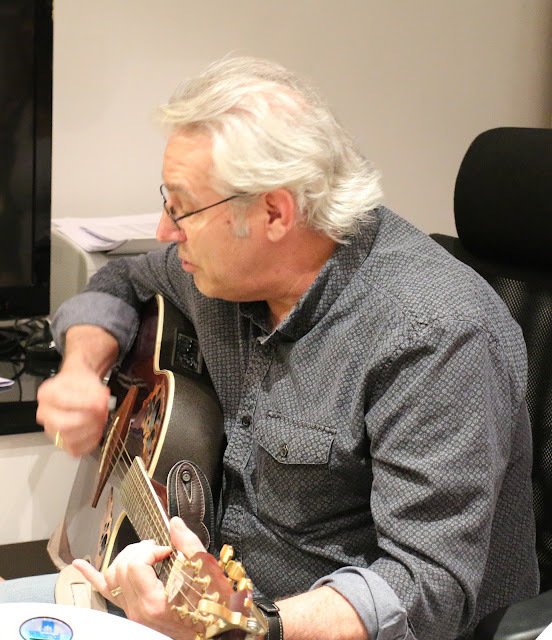 He transforms us to different places with his Ukrainian folk songs and can even sing some French songs in French.